Cheerful was always my dad's hero and the man who gave him his first job around elephants with the Al G. Barnes Circus in 1921. Cheerful started out with Ringling Bros. in 1903, then St. Louis Worlds Fair, Carl Hagenbeck Circus, Hagenbeck Wallace, Patterson Shows, J.E. Henry Circus, Sun Bros., Cole Bros., Walter L. Main (Andrew Downie), Al G. Barnes, John Robinson, Hagenbeck-Wallace (Corp. owned), Rusell Bros, Arthur Bros, Polack Bros. and finally Howard Y. Bary's Zoo Train in 1951 before his death in 1952. This picture was taken on Cole Bros. Circus in 1915 owned by J. Augustus Jones, their names were "Myrtle", "Bonnie" and "Babe". 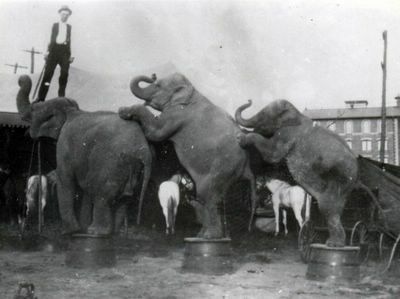 When this show folded in 1917 they were sold at auction to Charlie Sparks and in 1932 when John Ringling took the Sparks Show off the road they were among the 9 elephants absorbed into the RBBB herd bringing that number to 41. The horses look as though they are a part of the act. I really like to see the gentlemen doing mounts. This shot is a very good one. Was Cheerful his real birth name? Or was he really crabby? His real name was Frank. I don't know when he picked up the "Cheerful" moniker however you are right, he was anything but. published in the early 1990's. that featured elephants,a few were unreleased. I am trying to find out all the films he worked on with his elephants. I re-read the article it was closer to 20 movies he made. I wish there was a list that named all of the movies with elephant acts.